Nothing better than a sizzling platter of goodies to make the Tex Mex build your own "sandwich" known as a fajita! The creative possibilities are endless and they can please the vegetarian as well as the meat lover. For the vegetarians, just make sure to have plenty of portabello mushrooms. Ordinarily I marinate flank steak in a big freezer bag with a liberal amount of balsamic vinegar and most of a little jar of chopped garlic and do likewise with portabello mushrooms in a separate bag. For a variation, I sometimes add a bit of that Instant Smoke stuff, but not always. Marinade at least an hour, turn frequently and bring to room temperature before grilling. When the coals are ready, grill both til done, slice, and fight off the *neighbors who are now all standing by your fence, plates in hand, asking what on earth that heavenly smell is and when should they come over. Don't recommend this marinade if you use chicken. It "colors" the meat unattractively, just rub with spices and grill. *true story, well, true except for the plates. Recently made chicken fajitas without the usual and most excellent addition of that outdoor grilled over coals flavor because I did not decide until the last minute what I wanted to eat. Sure, it's better if you can do the meal over coals, but this did just fine in a pinch and since chicken can be done without a marinade that was the meat of choice. 3 thin chicken breasts coated liberally with your favorite fajita seasoning or other southwestern combination of seasonings. I used Emeril's this time. Pan fry til browned and just done with a little olive oil over medium heat, allow to sit a bit covered with foil to keep warm and slice before serving. 1 portabello mushroom given the same treatment of liberal seasoning, sliced, and sauteed in the chicken pan til softened and add to covered plate of chicken. On another and much prettier plate, arrange sections with a pile of quartered cherry tomatoes or the tomato of your choice cut small, slices of sweet yellow onion, sliced jalapeno peppers, and torn lettuce of your preference (I used red leaf lettuce as you can see by the darkened lettuce edge to the right hand side of the "fixings" pile on the tortilla, but the type of lettuce is totally up to you). In a bowl, squish the juice of 1/2 a lime. Then slice a not overly soft Haas avocado in half and pull apart. Use a spoon to scoop out the seed. The use the spoon to scoop bite sized lumps of avocado and add it to the bowl of lime juice and stir to coat. Scoop out the brown bits if needed - always good to have a spare avocado or two! The lime juice will keep the avocado from turning an ugly brown. If you like the taste of lime, squish in the other half too! You could make guacamole if you prefer, and that's best kept simple: scoop the avocado(s) into a bowl with the squishings of lime juice, add a little minced garlic and mash all together, taste and add a pinch of salt if you like (I used to use celery salt and it was very good that way too). That's really all you need to do, however if you want to get fancy, add tiny bits of tomato and jalapeno as that is also very good. 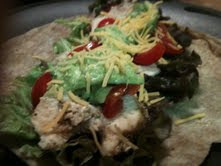 I don't suggest using picante sauce or Tabasco as that tends to "color" the guac and it's prettiest nice and green! For me, the more you "do" to the guacamole, the less guacamole-like it is. I've seen people make a horrid pale green mess by adding things like sour cream or some such abomination. *shudders*. Do not ever do that. Set all this on the table with some grated sharp cheddar and your favorite salsa and get creative, or even competitive, as you build your sandwich! I was hungry for a mid-morning snack and decided that fruit was what I wanted. 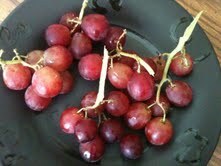 As a mindfully aware consumer of deliciousness I stopped and before I even opened the fridge, I held an internal debate with myself over which beautiful fruit to enjoy, but once the door was opened the decision was made for me as front and center in a pretty red plastic bowl was a mountain of freshly washed red seedless grapes. Did not even bother looking at the layer of goodies in the fruit drawer itself because I had to have those grapes. Before my experiment in mindfulness, I would have grabbed the bowl from the fridge and noshed until I was done. Not a very mindful way to eat. Mindful eating intentionally engages all the senses. So I individually selected small clusters of grapes and arranged them on the small black stoneware plate until I was satisfied with the presentation. 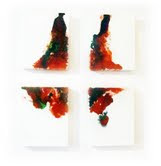 Then I sat in my favorite chair feeling the pop as each plump orb separated from its stem. The contrast of the crispy crunchy outside and the juicy insides with the accompanying burst of aroma and flavor was intensely satisfying. This was so much more than just a snack because I didn't mindlessly grab a handful of grapes, I created a beautiful and delicious treat and enjoyed it well from start to finish. One thing I don't like to do on Labor Day, is to, well, labor. So we had a variation on one of my favorite grilled and roasted meals - grilled prime sirloin and pineapple rings served with oven roasted mixed seasonal veges. The meat was glorious. I have to admit that the wonderful flavor and aromas of grilled steak or lamb is the main reason I am not a vegetarian. This time the roasted veges consisted of quartered mini-bellas, thick chunks of yellow squash and beautiful green zucchini, with fat slices of onion all coated with my favorite olive oil and tossed together with loads of garlic, fresh ground black pepper and a bit of sea salt (roast in a pan at 375 for about 40 minutes). 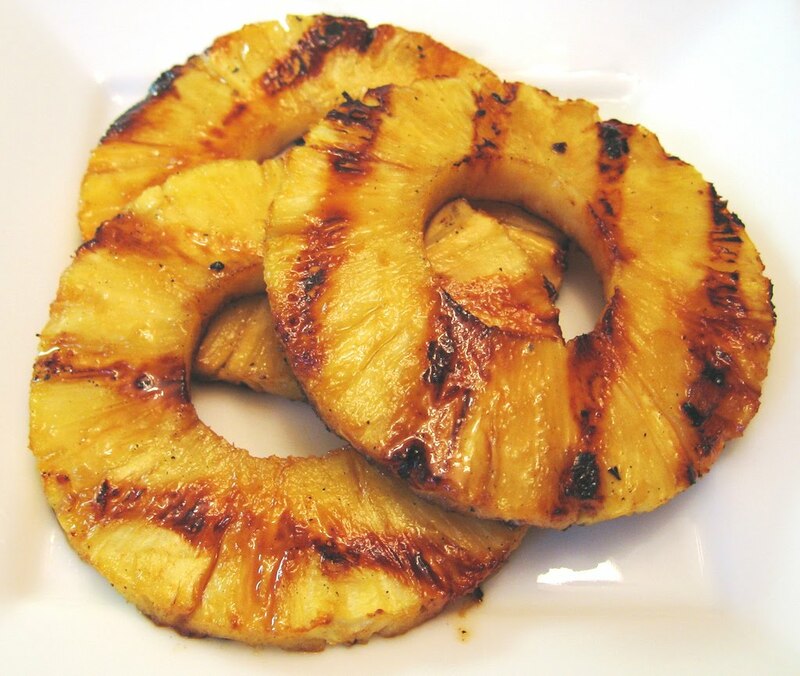 For me, the star of the show is always the beautifully charred rings of golden sweet pineapple. 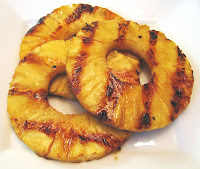 Grilling adds a wonderful savory element that combines perfectly with the natural sweetness of the pineapple. There is no need for dessert, simply make sure that your last bite is a bit of grilled pineapple. It's easy and delicious. If you are lucky, you live in a place where you can buy freshly cored and pared pineapple. Then all you have to do is make thick slices (at least 3/4 - 1 inch thick) and grill them about the same amount of time you would a steak. If you must prep the pineapple yourself, it's not that hard. Cut off the top and the bottom using a large sharp knife. Then from top to bottom slice off the rough exterior working your way all around – do not worry about cutting away too much even if it seems wasteful, just cut til all the tough skin is mostly gone. Then cut thick slices and section out the core for each slice. There is no need for a marinade or glaze of any type, let the flavor be real and true to the fruit. Simply perfect. The seal tells you what percentage of the product is whole grain and the number of grams offered in a serving. Ideally half or more of the grains we eat should be whole grains. I doubt if many of us even reach 10% of the recommended grams. Eating enough whole grains has been shown to be an aid in attaining a healthy weight because they fill you up for fewer calories, keep you fuller longer than refined grains, and provides more nutrition which the body uses to burn off excess fat. As losing weight is one of my personal goals, it is a no brainer to include more whole grains with each meal. Just have to love a diet tweak that has you eating more food! On September 1st, I was delighted to discover that the Whole Grains Council has declared September Whole Grains Month! Found that out because I Liked both organization's pages on FB. Go Like them yourself! A quick look through my pantry revealed several items that had the seal, such as the Uncle Ben's. Win! However, I also noticed that I had several packaged foods that were made from mostly refined products. This means that the healthiest part of the grain has been removed. The tasteless remains are then "enhanced" with "natural" flavor and vitamins. This does not sound like the description of any beautiful, delicious, or healthy glorious food. So, in honor of Whole Grains Month, my goal is to replace as many of these foods as possible with an equivalent product that, preferably, has been given the WGC seal of approval. 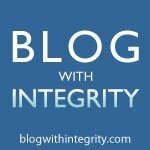 Can I make more permanent, healthier, and tastier changes in my diet without extending the amount of preparation time? Can I do it and keep my focus on the beauty and delicousness of each meal? I do work a day job so time for cooking is restricted. First up for a change are a couple packaged rice and vege side dishes. 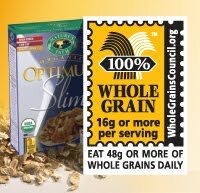 I'll look for an equivalent that has the seal - or at the very least indicate that they are whole grain. However, my first thought here is, the UB brown rice takes 10 minutes to prepare. 10 minutes. I can thaw out some frozen peas, or saute some onion, garlic, and sweet red pepper, or nuke any number of veges while the rice cooks and then mix them together with a little olive oil and maybe a seasoning or two. It will take no longer than boiling the dried out veges in hope that they will form some approximation of their original plumpness. It will certainly taste better. Going shopping tomorrow and will report back on items that I find in the store with the seal.